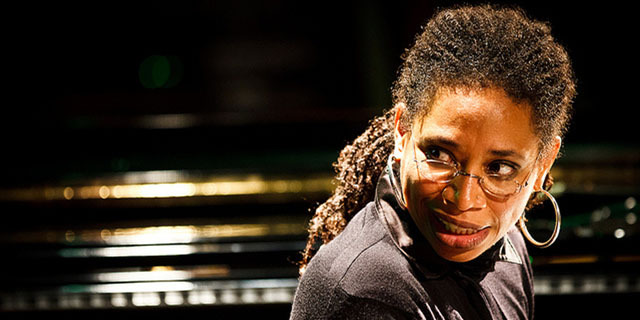 Composer, lyricist, arranger, musician, and vocalist Rachelle Ferrell is a recent arrival on the contemporary jazz scene, but her visibility on the pop/urban contemporary scene has boosted her audience's interest in her jazz recordings. Born and raised in the Philadelphia area, Ferrell got started singing in the second grade at age six. This no doubt contributed to the eventual development of her startling six-and-change octave range. She decided early on, after classical training on violin, that she wanted to try to make her mark musically as an instrumentalist and songwriter.In her mid-teens, her father bought her a piano with the provision that she learn to play to a professional level. Within six months, Ferrell had secured her first professional gig as a pianist/singer. She began performing at 13 as a violinist, and in her mid-teens as a pianist and vocalist. At 18, she enrolled in the Berklee College of Music in Boston to study composition and arranging, where her classmates included Branford Marsalis, Kevin Eubanks, Donald Harrison, and Jeff Watts. She graduated in a year and taught music for a while with Dizzy Gillespie for the New Jersey State Council on the Arts.Through the '980s and into the early '90s, she'd worked with some of the top names in jazz, including Gillespie, Quincy Jones, George Benson, and George Duke. Ferrell's debut, First Instrument, was released in 1990 in Japan only. Recorded with bassist Tyrone Brown, pianist Eddie Green, and drummer Doug Nally, an all-star cast of accompanists also left their mark on her record. They include trumpeter Terrence Blanchard, pianists Gil Goldstein and Michel Petrucciani, bassists Kenny Davis and Stanley Clarke, tenor saxophonist Wayne Shorter, and keyboardist Pete Levin. Her unique take on now-standards like Sam Cooke's "You Send Me," Cole Porter's "What Is This Thing Called Love," and Rodgers & Hart's "My Funny Valentine," captured the hearts and souls of the Japanese jazz-buying public. In 1995, Blue Note/Capitol released her Japanese debut for U.S. audiences, and the response was similarly positive. Her 1992 self-titled U.S. debut, a more urban pop/contemporary album, was released on Capitol Records. Some people sing songs like they wear clothing, they put it on and take it off," she explains in the biographical notes accompanying First Instrument. "But when one performs four sets a night, six nights a week, that experience affords you the opportunity to present the song from the inside out, to express its essence. In this way, a singer expresses the song in the spirit in which it was written. The songwriter translates emotion into words. The singer's job is to translate the words back into emotion." Ferrell has made her mark not as a straight-ahead jazz singer and pianist, but as a crossover artist who is equally at home with urban contemporary pop, gospel, classical music, and jazz.